We celebrated my husband’s birthday last week. 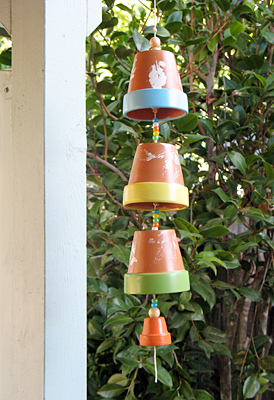 In addition to the veggie plants we bought him for the garden, the girls and I made him this fun flowerpot wind chime. I had seen pictures of wind chimes like this – they seemed pretty simple to make, so we gathered a few things and winged it! rope, jute, heavy duty string, etc. 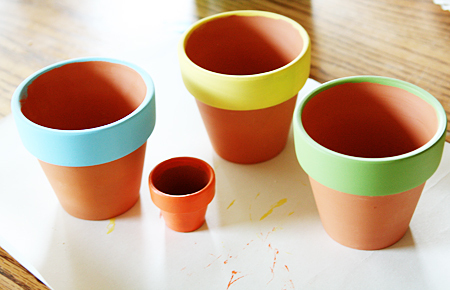 First, we painted our pots with acrylic craft paints. 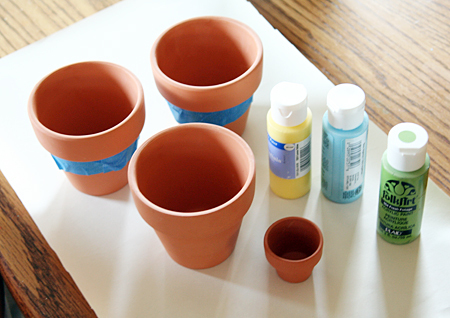 We decided to paint the rims solid colors, followed by making some leaf prints on the body of the pot. I used painter’s tape to help the girls paint the rim with a clean edge. When the pots were dry, I painted a couple coats of clear sealer on them. I just used what I had – any type of clear paint-on or spray sealer would work. Time for beading! 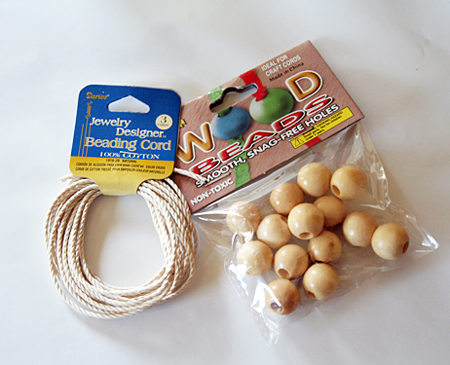 We used some large wood beads and cotton string from the beading section of the craft store. We also used a few pony beads that we had on hand. My hands were too busy to take pictures of the beading process, but here is a photo of the inside so you can see how we did it. The top wood bead holds the pot in place and the lower wood bead is the part that hits against the pot to make the chime. The pony beads are purely decorative! 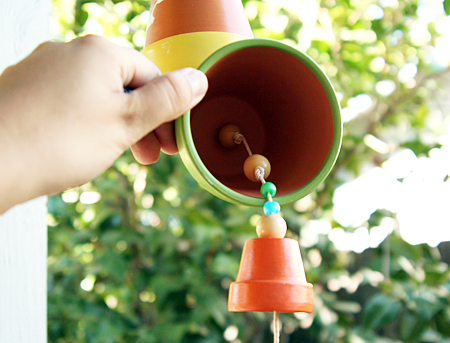 This was such an inexpensive project (I spent around $5 on flowerpots, string, and wood beads). 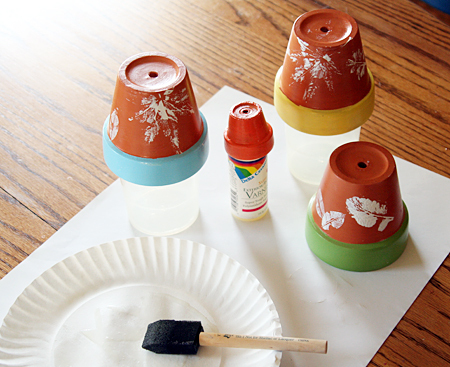 I can think of so many other fun ways to paint and personalize these! Also, this is a very quiet chime – it makes some light tinkling noise in the breeze. I think it looks lovely hanging in our backyard! What a great idea – it’s lovely! aww, that turned out so cute! might have to try that for the grandparents. This is a great project! I love your site. What a beautiful present to make. Such a fantastic, inexpensive idea that looks so impressive. Awesome! I am going to dig some jars out of the recycling right now so we can do this. I think we’ll do candles, a Halloween type theme. 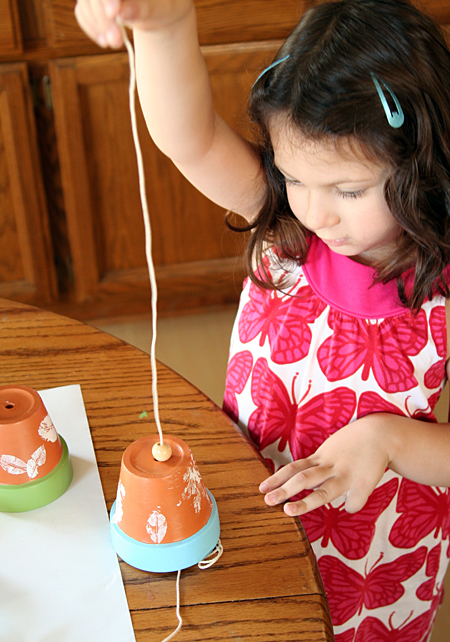 We have actually made mod podge flowerpot chimes!! To get a slightly better sound, we added little bells along with the beads. We also tied some of the pots really close together so they touched. I love the leaf prints, what a great idea! Thanks as always for the wonderful ideas! 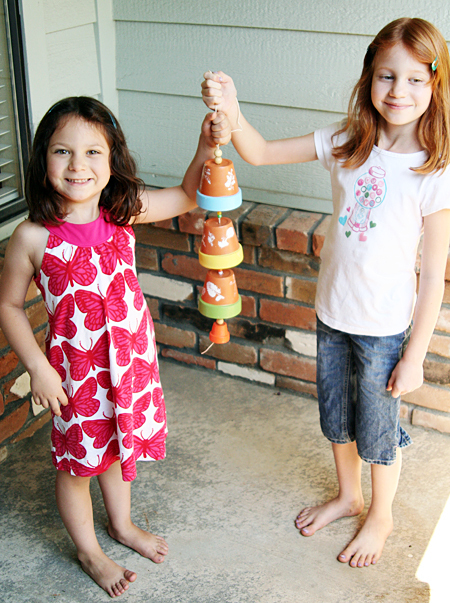 I have been looking for an easy windchime to make with my two little ones and this is just perfect. I can’t wait to try it! This is a great project. It’s something we can do now in the middle of winter to get ready for spring. Thanks for sharing. What a great project for the whole family. I really like to receive handmade gifts from my grandkids. Thanks for sharing this great idea. I’d love it if you shared this with the Fun Family Crafts audience. FFC is similar to Craftgawker but it only features kid friendly tutorials. Looking forward to seeing what fun crafts you submit!